Through extensive testing, personal experience, and talks with tennis beginners, my top choice for beginners is the Head Ti S6. Packed with power and easy to handle, this tennis racquet will let you get on the court and start playing immediately. The very first thing you should be thinking about on your tennis journey is what racquet should be using. Do you want one that’s gigantic and light? Or would you prefer a slightly heavier racquet to force you to focus on your form? Your tennis racquet affects EVERYTHING about tennis and is one of the most important decisions to make. Powerful and light, this is my top pick for beginners. Perfect on all aspects of the court, this is a racquet you'll play with for years. After reading this article, you’ll be prepared to grab a tennis racquet and get on the court. We understand it can be hard sometimes to choose and if you choose a bad racquet as a beginner, it can affect everything about tennis. As a beginner, you don’t want to worry about the correct string tension, string type, racquet size, or racquet type. We’ll take you through the main characteristics of the best tennis racquets for beginners and explain to you our thought process the entire way. One of the trickiest things when playing for the first time is timing your shots so that you strike the ball correctly. Ideally, you want to hit the tennis ball exactly in the center of the racquet. This spot is called the sweet spot. Having a racquet with a larger head size gives you more space to hit the ball and allows you to hit the ball in the sweet spot more often. 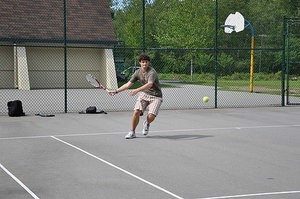 The best beginner tennis racquets will usually have a bigger sweet-spot allowing you to easily build up the habit of hitting the tennis ball correctly. Luckily, there are lots of racquets now that have big head sizes and generous sweet spots so you have plenty of choice(for my favorites see below!). A large head size is especially important if you are a beginner as it will help you enjoy the game more and improve quicker. Guess what the biggest part of enjoying tennis is? Hitting the balls over the net! A tennis racquet with a large head size (specifically 100 sq inches or greater) will allow you to do this. As a beginner, you need something that will give you a good amount of power so you can get the ball over the net and be competitive in games. In fact, power is usually related to head size. So when you grab a racquet with a larger head size, it will typically give you more power. But why is power important? When you first start learning tennis, you will most likely have a shorter stroke. Common beginner mistakes are forgetting to setup for the shot properly or follow all the way through. What this means for you though, as a beginner tennis player, is that your shots won’t have a lot of power! And as a result, you’ll stand in what’s called “No Mans Land”. Choosing a powerful tennis racquet will allow you to stay at the baseline and still get shoots over the net. 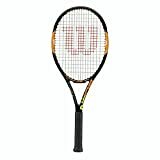 My favorite tennis racquet for power that I recommend for beginners is the Head Ti S6. If you’re just starting out, its combination of a large head size and powerful strings is designed exactly for you. A powerful racquet combined with a large head size, will make you unstoppable against your friends. A good starter racquet will also usually be lightweight as this will allow you to play longer and prevent injuries such as tennis elbow. Heavier pieces of gear tend to be harder to play with and maneuver so it’s best to go lighter to start with. One word of advice though is to not go too light as this could make you flick your wrist too much and may cause injury. If you go somewhere in the middle between 7 to 10 ounces, you should be fine and have a good balance between punch and playability. It’s important that you have a racquet that is comfortable to use and the grip is a main factor when considering this. When you are buying your racquet check what material the handle is made from and make sure it feels good when you pick it up. In terms of how to check the grip like a pro, check if you can fit your little finger between the ends of your thumbs and other fingers when holding the racquet. If you can, you’re good to go! The standard grip recommendation for men is 4 1/4 and for women 3. If you want more information on how to find your grip size, check our article on it! This is the best selling tennis racquet that Head has thus far made and it’s no surprise why. You’ll see it’s capability instantly on the tennis court. It has a superb mixture of features and usability that makes it a perfect choice for beginners. Summary: With a big sweetspot, the Head Ti S6 is the perfect tool for beginners to start playing tennis and work on their form with. With a frame made from the latest TI design process, titanium is woven into the graphite of the racquet. This makes it lightweight and flexible yet the Head Ti S6 has enough stiffness to provide control and power. This has a massive 115 inch head and big sweet spot which gives you more surface to strike the ball with and a more forgiving feel. An interesting feature of this product is the extra long 27.75 inch handle which you don’t see in a lot of racquets. This is great for added reach and for help when serving the ball up. At 7.9 ounces, it is certainly light and you can feel this in how easy it is to swing and play shots with. All in all, this is a brilliant racquet and one that has the perfect mix of power, touch and flexibility. Head is one of the premier companies in tennis and with this racquet they have come up with one of the best tennis racquet for beginners. 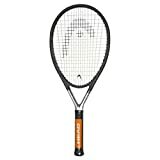 My personal favorite, this racquet is one of the absolute best tennis racquets for beginners and Babolat should be proud that they have done it again, with another top class product. Summary: With a big racquet head, the Babolat Drive is a great racquet for tennis players who want to keep playing for years. While slightly more expensive than the Head Ti S6, this racquet’s capabilities will last you years. Weighing in at 9 ounces, it’s just right for the player starting out in tennis. It’s heavy enough to provide power and stability without being too cumbersome. The Babolat Pure Drive tennis racquet also has a thick, solid frame that provides lots of power for minimum effort. As with a lot of beginner tennis racquets the sweet spot is large making it very forgiving on any mis-hits. The head size itself is 115 inches which is perfect for beginner tennis players and ensures you’ll have no trouble hitting the ball and sending it back to your opponent. A nice touch is the Cortex dampening system Babolat has incorporated which dampens any vibrations you would otherwise feel when striking the ball. The reason I like the Babolat Pure Drive is that it allows beginners to grow with it. As your skills develop on the tennis court, you’ll be able to stay with this Babolat racquet and learn more about applying spin to shots or the different aspects that go into different serves. If you’re planning on learning and staying with tennis for a while, start out with this great racquet. In addition to having amazing specs, it also looks amazing! Coming in at #3 on our list of the best beginner tennis racquets is the Prince Textreme Tour. 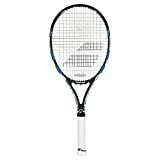 This Prince racquet is comfortable and allows players to easily feel and control the ball making it perfect for beginners. It’s also one of the cheaper tennis racquets on this list! Summary: A little heavier than the other racquets on this list, the Prince Textreme Tour is perfect for beginners who prefer control over power. Easily learn how to hit accurate shots with this racquet. The name Textreme comes from the Textreme material added into the construction of the racquet. Also used in Formula 1 Cars, this is a strong and light material that gives this racquet stability without adding much weight. In the Prince Textreme, this results in a lightweight racquet weighing in at 10.8 oz. But the reason I really like the Prince Textreme is it’s mix of comfort and control. When playing with this racquet, the frame does a lot to cut down on the vibrations when hitting a tennis ball. If you want an extremely comfortable racquet that can grow with you as you become better, this is the beginners tennis racquet for you. At such a lightweight, you’ll find this racquet easy to swing through the air and comfortable in the palm of your hand. The beauty of many of Prince’s line of racquets is the control and feel they give to players. Coming in at a lower price than other racquets on this list, the Prince Textreme is perfect for beginners just learning the game. Wilson is one of the most well known brands in tennis and with good reason. Their products are always superbly made and designed with the result that they’re fabulous to play with. Summary: The Wilson Burn is capable across all aspects of the tennis court. PErfect for anybody from teenagers to adults just starting, burn your opponents with this Wilson Burn tennis racquet. 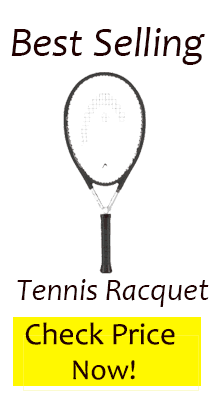 This is a real player friendly racquet and one that will make a great tennis racquet for any beginner. With a 100 sq inch head size, there is ample space for those new to tennis to easily hit tennis balls in the sweet spot. One of the aspects of the Wilson Burn that I like specifically is it’s degree of control. While testing this racquet for the full Wilson Burn 100 review, I found this racquet amazing at controlling where the tennis ball went. If you’re having trouble with your aim in tennis, I’d advise the Wilson Burn or the Yonex Ezone (below) over others on this list. The Wilson Burn is a little heavier at 11.8 oz than most of the best beginner tennis racquets that we’ve recommended so far. On the court though, this Wilson racquet feels light and you can easily swing it through the air. Yonex is not a company that many new players will know but they are a great one nonetheless. Based in Japan they have built a reputation for designing innovative, quality products. Summary: This is a tennis racquet that makes a lot of top 10 lists. Perfect for anybody just starting to play to people with tennis elbow, this racquet is comfortable and easily used by beginners. This racquet is made from graphite which makes it very stable but not too heavy to use for new players. I love the look of it and the way it has been designed with style and sleekness in mind. It is very comfortable to hold and use which is a real plus point. The head size is an ample 100 inches which is great for controlling the ball even if you don’t hit it quite right. It is a head heavy racquet which gives it extra power and depth to put behind your shots. Yonex have built in an open 16 x 19 string pattern which also helps in generating power and spin. You may not have come across Yonex before but they are a great company and this racquet in particular is worth considering. As a beginner to the sport, it has all the attributes you would need to start playing right away. Racquet selection is absolutely key for new players just coming into tennis and their subsequent progress within it. If you take the time to get that right, then you will use it for years and have hours of enjoyment out on court. Any of the racquets above would be a perfect choice for any beginners and serve as an ideal introduction to the game. Can I simply say what a reduction to seek out someone who actually knows what theyre talking about on the internet. You undoubtedly know tips on how to convey a problem to gentle and make it important. More folks need to learn this and perceive this aspect of the story. I cant believe youre not more in style since you undoubtedly have the gift. I would highly recommend the Wilson Burn or the Wilson K Zero Strung rackets to beginners. Both racquets are easy to pick up and play with immediately. You got the info mixed up for the Babolat Drive 115 which is different from the Pure Drive with a 100 size head and weights 11.2oz / 317.51g. Wow you are absolutely right! I must have been tired when I published this. Thanks for the catch!